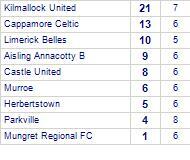 Abbey Walsh scores hat trick as Cappamore Celtic beat Murroe. Murroe has yet to win in this competition. Abbey Walsh moves to top scorer in this competition after scoring 3 times in this game taking the player's total scores to 6 goals.